A new story trailer for Watch Dogs 2 just arrived, bringing with it a fresh look at major players on both sides of the conflict between hacker collective DedSec and the corrupt corporations they’re working to take down. One of their biggest targets is Blume Corporation, an entity that should be familiar to Watch Dogs players as the creators of the notorious, city-automating ctOS. This video introduces a key antagonist, who appears to be pretty high up on Blume’s payroll: their Chief Technology Officer, Dusan Nemec. Nemec is taking the DedSec threat very seriously, and rightly so; we’ve already met a few members of the collective, and they are not to be trifled with. The protagonist, Marcus Holloway, has already stopped a mass surveillance initiative in Oakland using his unique set of skills. Sitara and her principled, artistic approach may not always vibe with Wrench and his aggressive, chaotic style, but there’s no doubt that both are passionate, driving forces fueling DedSec’s efforts. In this trailer, we also get a glimpse of Josh and Horatio, two other members that make up the DedSec crew. With a powerful array of hacking tools at your disposal and the open world of the San Francisco Bay Area at your feet, you and your fellow hackers will do whatever is necessary to stop Blume and their new, improved ctOS 2.0 from infringing on the freedoms of the citizens. 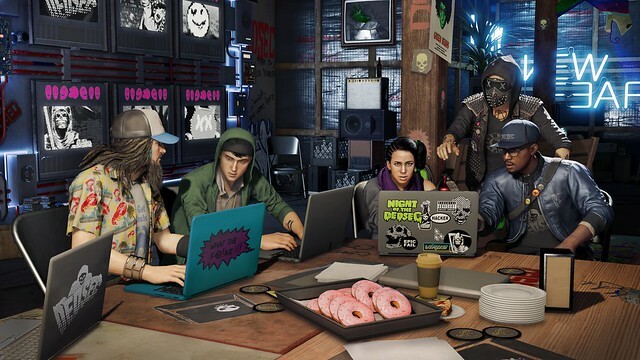 And with Watch Dogs 2’s seamless multiplayer connectivity, you can easily team up with friends or strangers to complete missions, gain followers, and unlock new missions, gadgets, gear, and more to help you take the fight to Blume and look good doing it. If you pre-order Watch Dogs 2 on PlayStation Store, you’ll get some exclusive bonuses that will take your fight even further. The San Bruno Radio Tower location offers co-op mission opportunities for you and your buddies to take on, and makes the Engineer Suit available for that fight-the-system-from-within look. Pre-ordering also unlocks the ScoutXpedition mission, in which you’ll tour San Francisco with a movie-location scout and visit some of the city’s most iconic locations (of which there are many). Finally, PS Plus members who pre-order Watch Dogs 2 on PlayStation Store will get the Bitflip, a full unique clothing set with an especially cool neon skull bandana. Join Marcus, Sitara, and the rest of DedSec when Watch Dogs 2 launches on November 15. Corrupt corporations aren’t going to expose themselves, now are they?